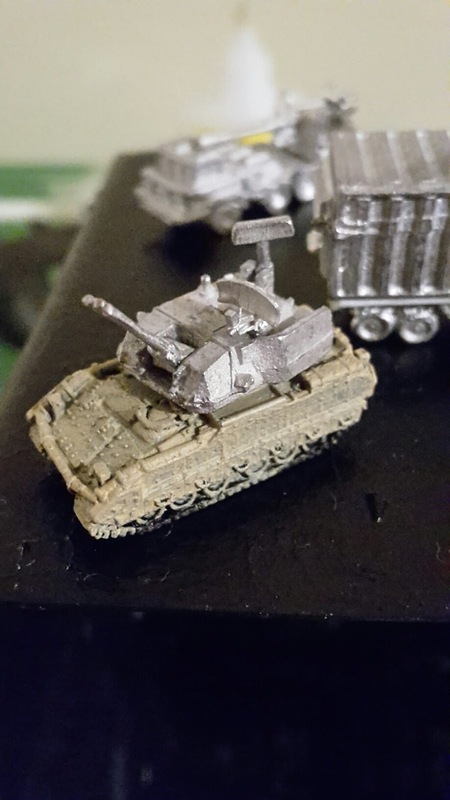 Down Under Wargames - Miniature battles in the Southern Land: Conversion Corner! - Now with 200% extra random bits and pieces! Conversion Corner! - Now with 200% extra random bits and pieces! Well the weekend so far has been very productive for me, albeit not the way I originally intended! I like to convert my models into things that may otherwise be unavailable in stores, or simply don't have enough pull in the gaming market to ever be considered for an actual release, so I have a thing I like to do with my miniatures where if a model has a turret, or some other removable part/ assembly I will run that piece across a gamut of different chassis' I have in various stages of construction. I do this to test out whether I can find any particular setups that provide either a solid representation of a real-world military unit, provide something that wins out on the "Rule of Cool" principle (the second rule one should always obey, the first being "Be awesome to one another" courtesy of Bill and Ted) and finally to see if I can kickstart my imaginative streak to find something else. 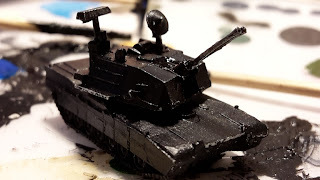 Well, today my imagination went into overdrive, and through some hacking, card cutting and simple chopping and changing of turrets, I now have some very interesting and diverse designs! The first two designs - A GHQ M6 Linebacker hull, with GHQ ADATS turret. 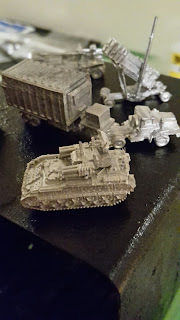 Behind it is a semi-trailer truck I have made using a Scotia "Patriot Missile Launcher" battery, a piece of plastic card underneath the cargo container to level the floor (you can see the card in the next photo), and a Ground Zero Games 15mm "small trunk" terrain scenic. I could have gone with waiting for a dedicated 6mm piece, but I like the bulkiness of these GZG pieces. 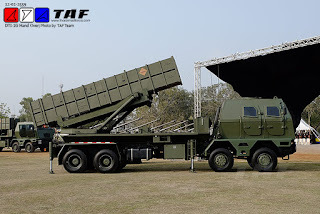 The M-5 Quarterback is the first of a new series of Rapid Development Air Defence Vehicles. Rapidly brought into production following the loss of air control across the Asia-Pacific with the denial or outright destruction of key high-value aircraft and airfields by enemy forces - the Quarterback utilised upgraded and updated ADATS missile systems on a refurbished M6 Linebacker chassis. The design would prove, like most of the RD-ADV series, to be a critical system in the coming years, and was surprisingly effective considering the unexpected development history. These next two are both based off of "SGT York" anti-aircraft turrets, but they come from different designers. The model on the left is a GHQ M6 Linebacker hull (I bought a few seperate for the ADATS tank... this kind of happened on a whim and looked awesome) with a SGT York turret from Scotia minis. 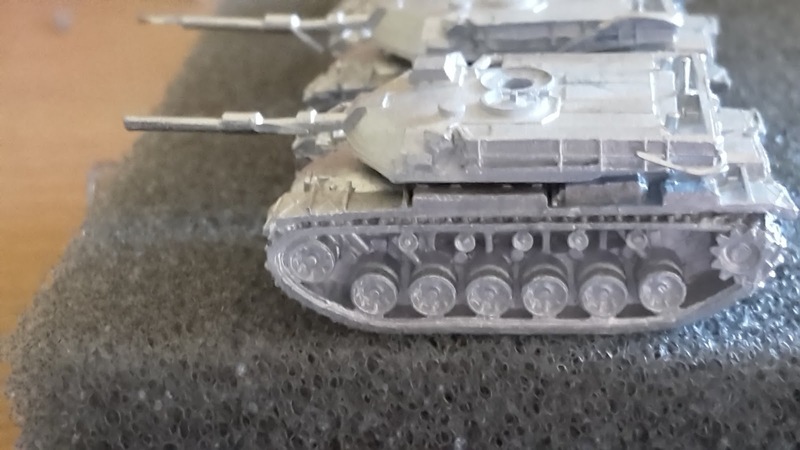 I used a GHQ ADATS radar to replace the funny old APG radar as used on the M1 Tank in this case... I like the mre modern appearance. The SGT York turret on the M1 tank, and the M1 tank hull itself, both come from CinC minis. 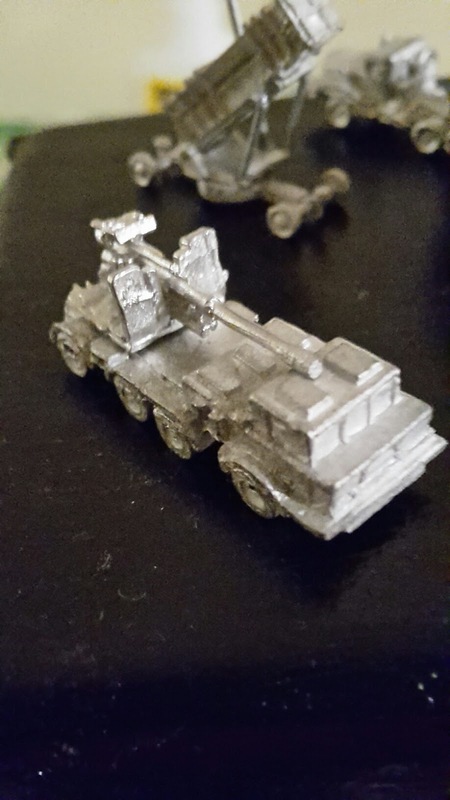 This is one of my first conversions I did when I started 6mm about six months ago. Sorry CinC, Scotia wins this round, I'll definitely be using the Scotia turrets from here in! The SGT York system has a varied and not-so-effective past in the Coalition air defence story. Originally designed towards the end of the cold war and found to be sorely wanting. Interest was again raised in the design as part of the Rapid Development - Air Defence Vehicle plan of 2017. Rebuilt with modern electronics and fitted with radar technologies similar to that used in the Swedish CV9040 self-propelled AA vehicle, the SGT York turret finally proved successful, and when mated with M1A1 hulls returned from theatres for repair, proved to be an excellent anti-aircraft platform and a brilliant surface fire vehicle with its new sensor-fused 40mm ammunition. The M1A1-ADV "Gunny Hathcock" became a common asset for divisional headquarters and specialised heavy anti-aircraft lead elements in armoured brigades. However, the SGT York's original design still didn't quite meet immediate requirements, especially regarding weapon type - and although the 40mm was effective, it was the only 40mm Bofors in US use. A slightly smaller, rebuit variant, with new 35mm Bushmaster III cannons and new fire control radar, was equipped on M6 LineBacker hulls in early 2018. The "Sgt Waldron" system was equally successful like its Gunny Hathcock forebear, and could carry much more ammunition due to the increased room within the hull. However, this was a double edged sword, and the vehicle was found to be top heavy and hard to conceal in hull down positions - these limitations were seen as little real consequence considering the platform was not intended to be required to situate itself directly on the front lines, although the stability issues with being top heavy were never fully resolved - the vehicle being speed limited in turns and on hilly terrain throughout its career. 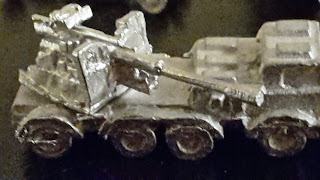 The design of this vehicle is two seperate models, the first one being a BM-27 MLRS truck (I must admit that I think the BM-27 MLRS launcher looks terrible on the intended truck... but put it on a Scotia G6 Howitzer chassis and it looks VERY awesome, like some Sci-fi MLRS! - anyway...) I am not sure who the truck is from, either Scotia or Heroic and Ros. The launcher is simply too stubby to actually look right, but of course, they are a hard model to do. So yes, a BM-27 MLRS truck body, and the cannon position from a Scotia KS-19 100mm anti-aircraft gun. When the Carter Regime (more on them in the future!) 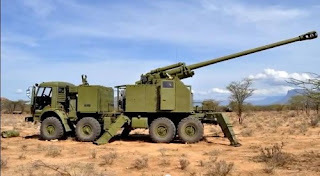 began to rearm its military in 2008, it began to look for cheap, but effective artillery systems. As the regime had very few friends due to its militaristic and overly fascist ways, the regime began to acquire designs and technology through subterfuge. One of the greatest achievments of their cloak-and-dagger acquisition techniques was the purchase of two NONA B-52 truck mounted artillery pieces from the Serbians. The design itself was examined and evaluated, and the Carter regime devised their own version with the materials available to them. Using the KS-19 anti-aircraft gun, readily available in large numbers, and the chassis for elderly FROG-7 missile vehicles that were no longer considered effective (even by Regime standards) the regime fused the two together into the "Iwisa" as it supposedly had a look like the clubbed walking stick, and could deliver a painful blow once it had "thrown" shells at the target. These vehicles, limited in numbers, were surprisingly active and proved a constant thorn in both Coalition and NewPact sides throughout their respective African campaigns. After making the above vehicles, I realised I still had a fully functional PATRIOT missile system ready to go... but no vehicles to put it on. By now I had already wanted to make either a WS-32, or, as above, a DT-1G replica (seriously, the launchers couldn't be any closer if I tried!) However without a HEMTT or similar to work with, I turned to the next best thing - the Scotia KS19 chassis! I now have two towed versions of the DT-1G Guided super-heavy MLRS... 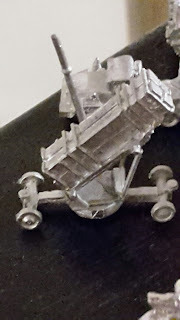 I like the idea of the launchers, and now just need to find some suitable towing vehicles! 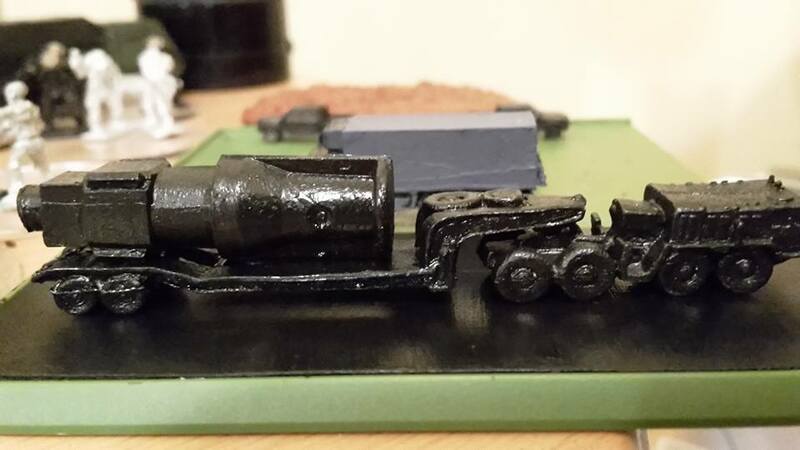 I had seen what I would call a "Super IED" made by one of the people on the "6mm wargaming and terrain" Facebook page, and it looked great! 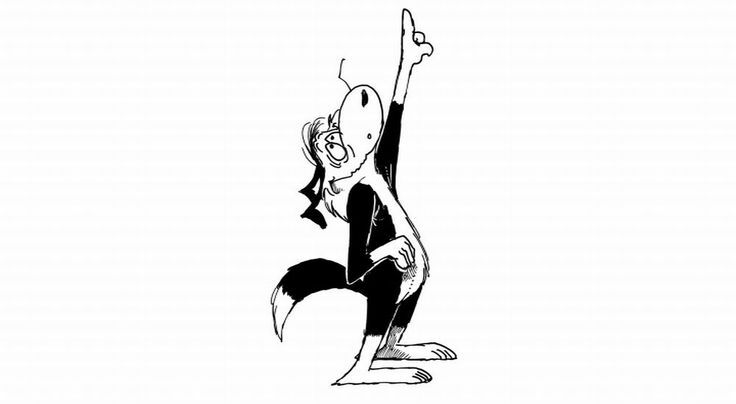 So, I was stuck for a body. I tried a greenstuff body first, but that just looked ridiculous. Then finally, luck came upon me a few weeks later when I was dallying about and had the glue cap and the chimney top in my hand... 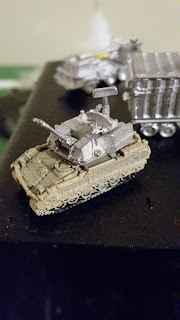 I pushed them together because they looked like they might fit... and it turned out the whole contraption not only looked like some MASSIVE bomb, but it fit snugly onto the tank transporter as well! Happy days! Finally, there is this little guy - the amalgamation of the remnants of the CinC M1 Abrams hull and the Sgt york turret. I was very surprised to find that the CinC M1 Turret and the M48 hull actually look really nice together! I named these vehicles the K-3 Black Dragon - as South Korea has M-48's in storage in case North Korea goes hot... and the potential for a rapid overhaul if needed shouldn't be out of the question in that case! Anyway, that's quite the upload, hope you liked it! Sorry all. A quick fix until I am back at my PC. The SGT York turret is not from Scotia... it is a Heroic and Ros variant!